When someone tastes the dish I prepare and when I educate them that there is alcohol in the dish, people usually just shrug it off and say “It’s alcohol, it has evaporated.” Well, that is true up to a certain point. You see, depending on the cooking method and for how long you cook a dish, it will greatly impact the remaining percentage of the alcohol. With that being said, it does not mean that you will get drunk if you consume a dish that has been prepared with alcohol. This is very important to know, especially if you are dealing with people who have allergies or have just recently stopped drinking due to health issues. When looking at the chart, what does this mean? It’s very simple. Cooking methods that include short and quick cooking, obviously retains the most alcohol. 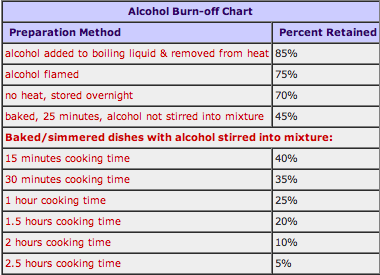 The common misconception that I have seen among people is that if you flambé something, most of the alcohol is gone. If you are not familiar with the term flambé allow me to explain it. It is a cooking procedure which involves a hot pan and high proof alcohol. Once you combine the two you create a burst of flames. Flambé is usually done at table sides in a restaurant for the wow effect and also for additional flavor. Flambéing can infuse a dish with additional aroma and flavor, while burning off some of the alcohol content. Granted this cannot be accomplished with beer. So what about beer? What happens if you make that stew with beer? How does that affect the overall taste? Stew is a combination of solid ingredients that have been cooked in a liquid and the overall dish is served with the cooking liquid. There are many ingredients that stew can include (vegetables, meat, poultry, seafood), and also the cooking liquid does not have to include water, necessarily. Some of the acceptable ingredients are wine, stock and also beer. While the stews are cooked on a low temperature for a long time, this allows the flavors to become richer. Do not forget that also less percentage of the alcohol will be retained in the final dish. Every once in a while I make a beer ice cream. What about that? how does the alcohol affect the taste of the ice cream? Granted the beer is cooked for about 10 minutes on a medium heat on the stove, but if you look at the chart, that means that approximately 40% of the alcohol content remained in the final product. Since I can keep on rambling about this subject all day long, let me conclude this post for now. What am I trying to say in the end? Inform your guests of the ingredients you have used in your dishes, just in case someone is allergenic to something. Just because you have “cooked” the alcohol, it does not mean that it is all gone. Help spread the word and when someone tells you next time that the alcohol is evaporated, please correct them. There are lots of misconceptions about food going around. Especially when you combine alcohol! It is surprising to me that craft beer drinkers are too often not always craft food eaters. Craft beer drinkers are often proud of the fact that their beers do not contain the adjuncts or chemicals that the large macro brewers use. However many will happily eat low quality, mass produced food. When Stone brewery first opened their restaurant, they created a menu that contained as much of a focus on quality ingredients, as they have on their beer. The result was their guests often complaining that they didn’t sell cheap bar food. In addition to being the largest purchaser of organic food in San Diego, the brewery even purchased a farm last year so they can even start growing their own vegetables. Stone’s World Bistro and Gardens is a great resource for how to merge craft beer with high quality food. Here in Vegas, we have several restaurants that do focus on both craft beer and food. Public House and Todd English’s PUB immediately come to mind, along with a few others. However, it isn’t practical for anyone to solely eat at these restaurants everyday, so what can someone do at home to enjoy both craft beer and food? 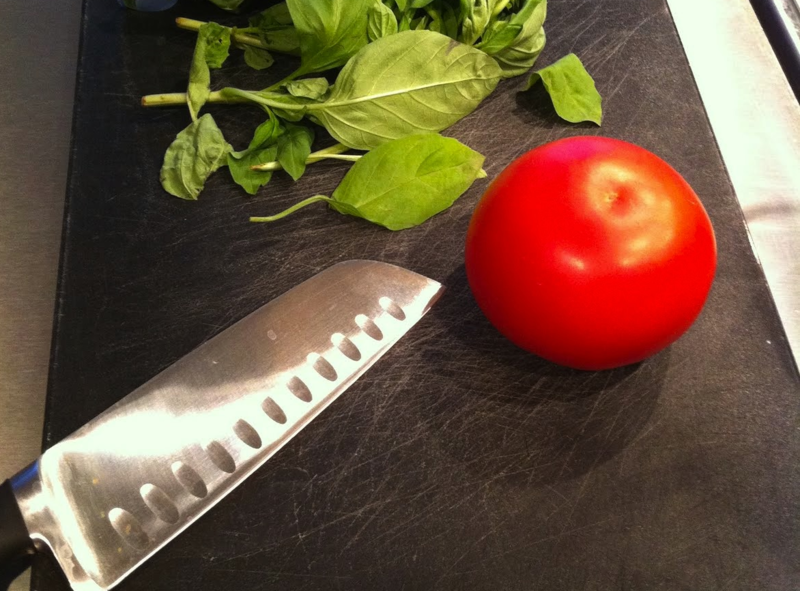 The first step is to start cooking, using as few prepared meals/ingredients as possible. Buy fresh meats and vegetables and prepare it yourself. I’m not saying you have to buy organic foods, and I’m not saying that you even have to eat “healthy” foods (though both are good options), all I’m saying is that you make your own food from fresh ingredients. Write down a few of your favorite foods, and look up recipes to make it yourself. If you love pizza, buy cheese, sauce, pepperoni, dough, and make it (even better, make your own dough). Do you like hamburgers? Heat up the grill and start making your own burgers. If you want to go to the bar and eat chicken fingers, then you should make your own. I guarantee that if you buy fresh chicken and make your own beer batter, it will taste better than anything you can buy in a bar where the focus is solely on making chicken fingers as quickly, and cheaply, as possible. There are many things added to these foods when you get them at your local bar that you would never use at home. Restaurant food is known for having ridiculously higher sodium levels than the freshly homemade equivalent. The fresher your ingredients, the more flavor the food will have and you will need less salt and fat to make it palatable. Even if it’s a bacon cheeseburger, the home cooked option is more likely to taste better and be better for you (bacon is a nutrient right?). 1. Great food will make a great beer taste better. The rich, hearty flavors in great dishes will match the quality of the beer and increase its refreshing characteristics. 2. 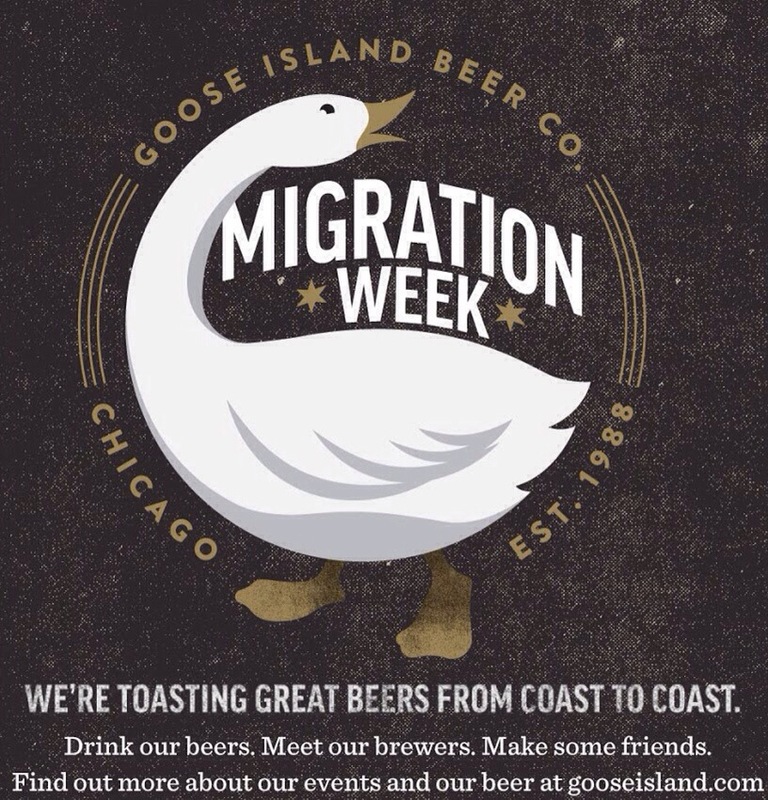 Great beer will make your food taste better. Because the quality of the food matches the beer, the flavors in the beer will match the flavors in your food. The caramel sweetness in a brown ale will match, and increase, the sweetness in barbecue. The light tartness in a hefeweizen will match and highlight the lemon flavors in seafoods, salads, or other dishes seasoned with lemon. Because beer and food have so many similar flavors, you will find a near infinite amount of ways to match food with beer. I am confident that once you begin to drink your beer with better quality food, you will enjoy both even more. 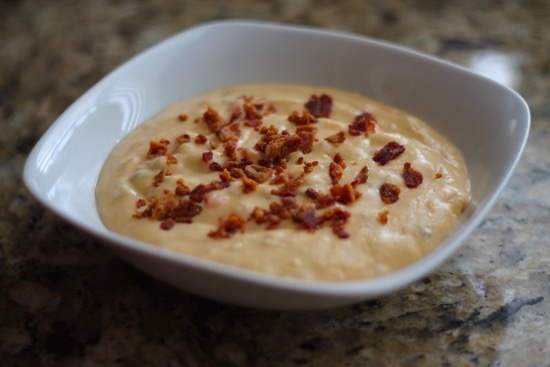 If you need help with recipes (especially ones using bacon and beer as ingredients) contact Hooked on Hops’ own contributor, Goran Cvijanovic. You can view a few of his recipes here on the site as well. Earlier I mentioned the struggles Stone had getting their guests to enjoy and appreciate high quality food. You can read more about this, and even get some recipes from the restaurant in their book. Rye is an acquired taste. I for one cannot stand rye bread. I do, however, enjoy rye beers. Many people either like one, or the other. Or neither. 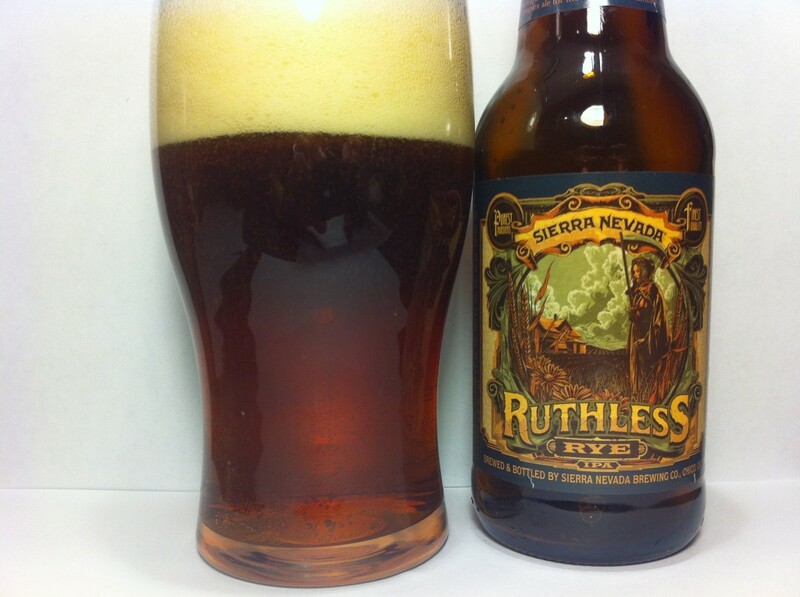 Rye adds a harsh, rustic, peppery taste in beers. 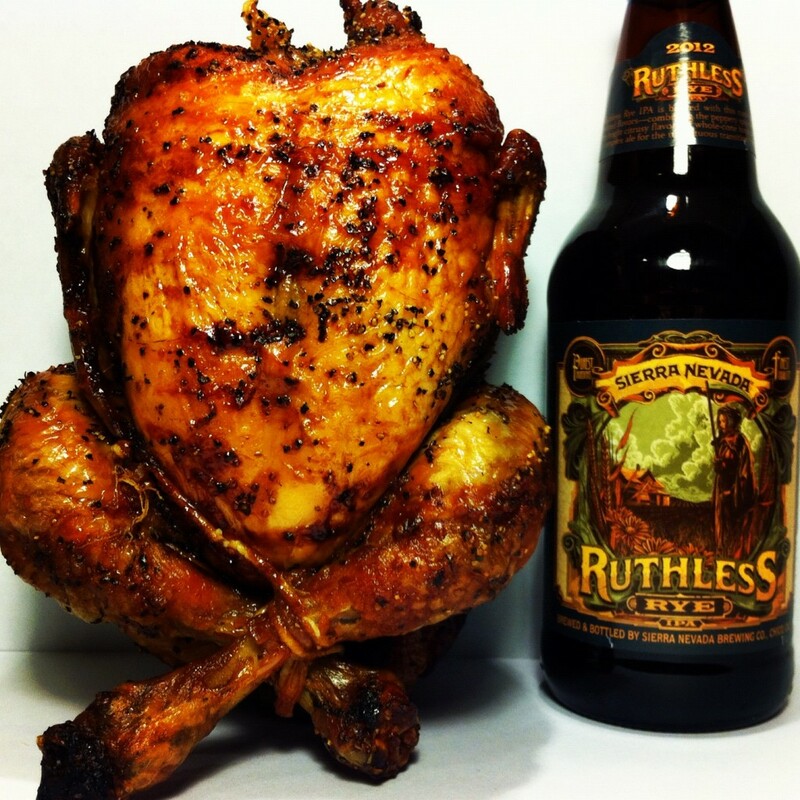 This makes Sierra Nevada’s Ruthless Rye the perfect beer for rotisserie chicken. 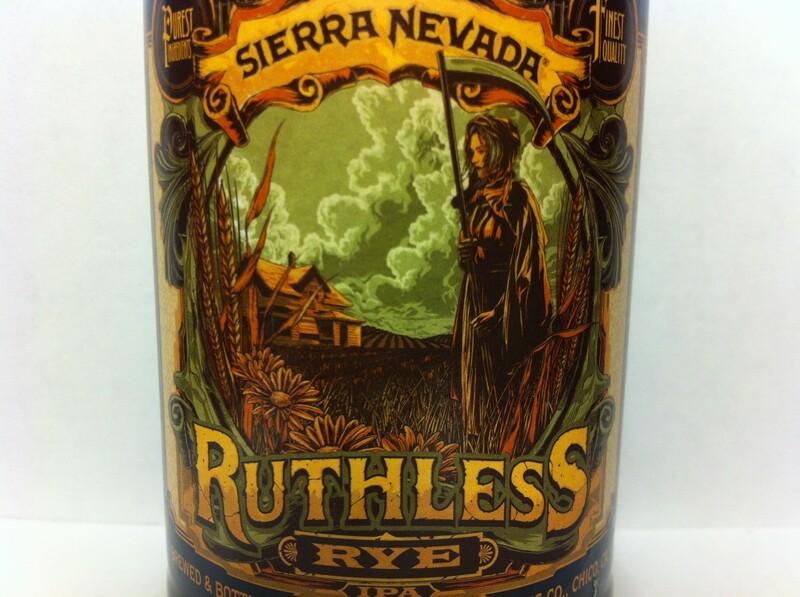 Ruthless Rye is a new IPA from Sierra Nevada that was just released about a month ago. The hop bitterness is very similar to their Torpedo IPA. This means that the aroma is also very citrusy, with an orange marmalade kind of sweetness. The rye in this beer gives this IPA a very different level of flavor and taste. This is not a smooth beer, instead there is a strong, harsh bitterness that can only be found in rye beers. Unless you’re fancy enough to know how to make a rotisserie chicken, I recommend you go buy one at the grocery store. 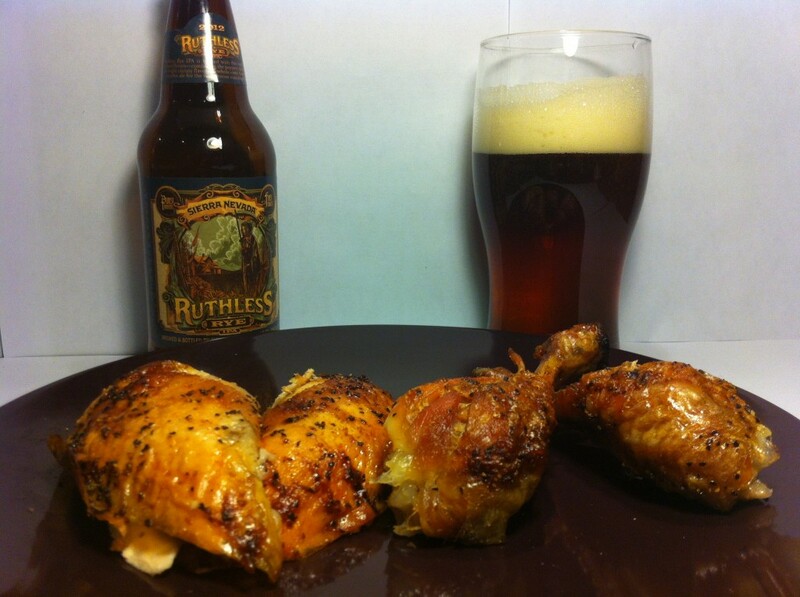 Chop up said chicken and eat it while drinking this beer. The peppery rye will match perfectly with the pepper and herb seasoning. The sweet, citrusy taste will match the caramelized skin on the chicken. Finally, the carbonation and bitterness will cut through the fat and lift the flavor off your tongue, preparing you for your next bite. Today we continue with our journey of beer pairing with food. For today’s edition we are making a delicious soup which just screams for attention. Once you have a spoonful, I guarantee you, you will be back for more. With that in mind, let us begin! Melt the butter with the oil in a heavy saucepan. Add the Onions, Garlic and Herbs. Season with salt and pepper. Cover and cook over a low heat for 40 minutes until the onions are silky and translucent. Stir in the Guinness, Stock, Worcestershire sauce, and Sugar. Bring in to a boil. Reduce the heat and simmer, uncovered, for about 20 minutes until the soup has reduced slightly and developed a rich, deep flavor. Meanwhile, toast the bread slices lightly on both sides under a preheated medium broiler. Cut the bread in desired shape. Pile each one with some cheese, then return to the broiler and cook until the cheese has melted. Ladle the soup into warmed bowls, float the toasted cheese bread on top, and garnish with a few sage leaves.